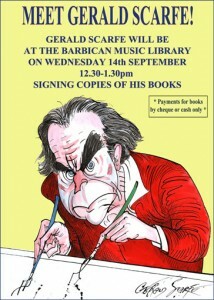 Gerald Scarfe will be at the Barbican Library between 12.30 and 1.30 on Wednesday 14th September to sign copies of his books. The appearance will be at the venue of the ‘Scarfe & Music Exhibition. Please note – only cash or cheque payments for books can be accepted.